Dubai, UAE, July 16, 2018: Heading into the second week of the Tour de France, Norwegian National Road Race Champion Vegard Stake Laengen analyses UAE Team Emirates’ chances of more success. After a dramatic week one on the tour – which saw UAE Team Emirates’ Dan Martin make history and take home the team’s first ever Tour de France stage win – we sat with Vegard Stake Laengen to discuss the week ahead, his experiences of these stages and the challenges his teammates will be face as they prepare for the first real mountain tests of this year’s tour. 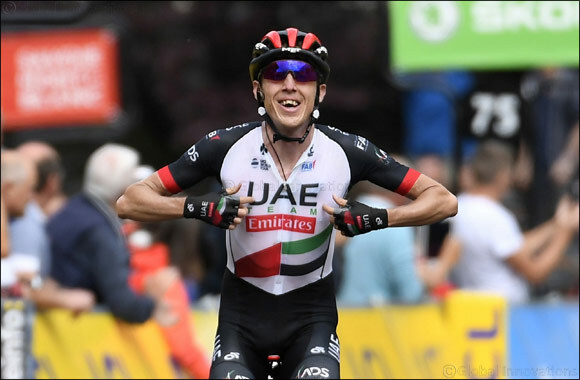 To stay up to date with UAE Team Emirates’ results during the Tour de France, follow the team’s official social media platforms on Twitter, Facebook and Instagram. To get a taste of the tour right here in the UAE, you can sign up to the UAE Team Emirates Youth Academy (8-29 July). Visit JustPlay.ae for more information.